For two weeks last September, we dutifully covered both our flowers and vegetable garden to protect them from the low night-time temperatures. And then we stopped. With a forecast of snow and a low of 24 degrees, we gave up trying. We harvested all the herbs and green onions and most of the carrots and chard. Then my husband brought in almost eight pounds of green tomatoes. We’ve had some past success attempting to ripen tomatoes by hanging the plants upside down in our garage. 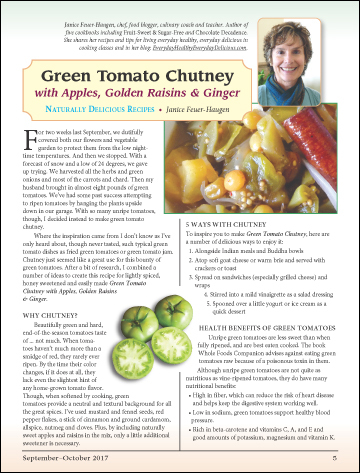 With so many unripe tomatoes, though, I decided instead to make green tomato chutney. ﻿Where the inspiration came from I don’t know as I’ve only heard about, though never tasted, such typical green tomato dishes as fried green tomatoes or green tomato jam.